Your bunny's cage should be as large as possible. A general rule of thumb for the minimum size of the cage is it should be three to four times as long as your bunny when she is stretched out. Of course, if you have a baby bunny you want to look ahead to her adulthood so you won’t have to buy another cage as she grows. The cage will ideally have a large side door for your bunny to be able to hop out of comfortably and a top door so that you can reach in easily and scoop bunny out if you need to. Rabbits love to toss and nudge. Great toys for this include thick plastic baby toys such as keys and stackable cups or special plastic rabbit toys. Because rabbit teeth continue to grow through their life time, they need to chew on things. Toilet paper and paper towel rolls, wood blocks and apple or pear twigs and small branches are great ways to take care of their chewing needs. 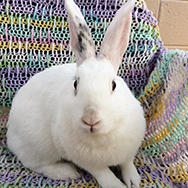 Place her water bottle, a pellet crock, a litter box, unlimited timothy hay, soft floor covering (a synthetic sheepskin rug is ideal) and some rabbit toys in the cage. Ideally, if the cage is large enough, your rabbit should have a comfy hiding spot to run to if she is frightened.